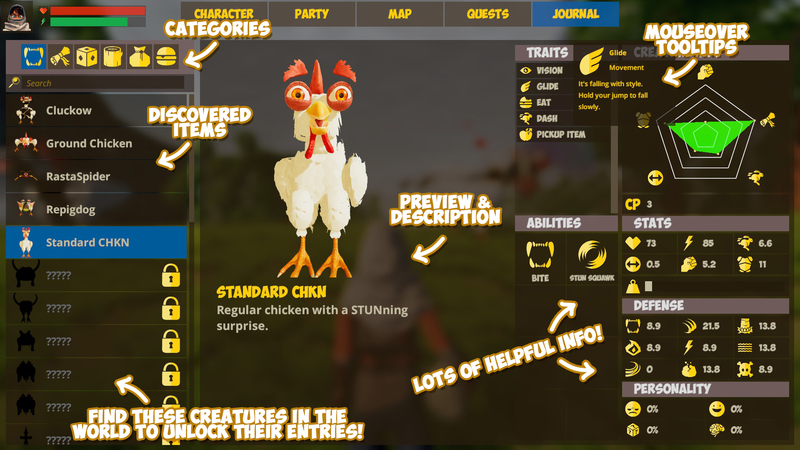 Be a master CHKN survivalist with the new Journal features! Plus new crafting stations, cleaner and clearer UI updates, and more. Patch notes are below and, as always, bugs are expected in these work-in-progress builds so we really appreciate the reports and feedback you send our way on the Pre-Release forum. 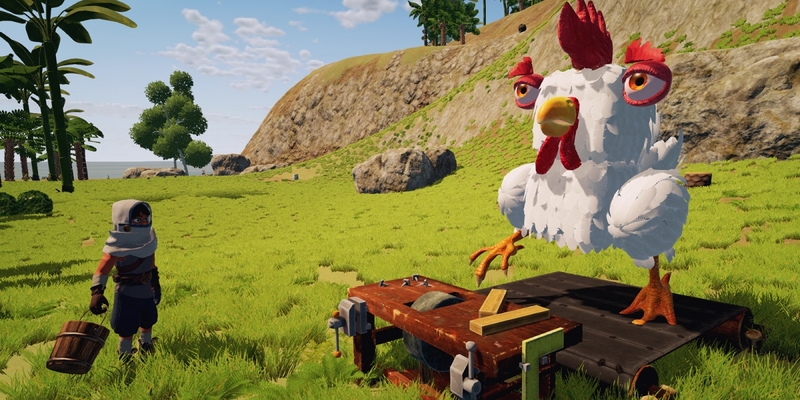 You’ll need the new updated Journal to survive and master the wild world of CHKN. It gathers all your collected discoveries and info for handy reference. You can now observe almost anything in the world to log it in your Journal: creatures, trees, rocks, bushes, etc. 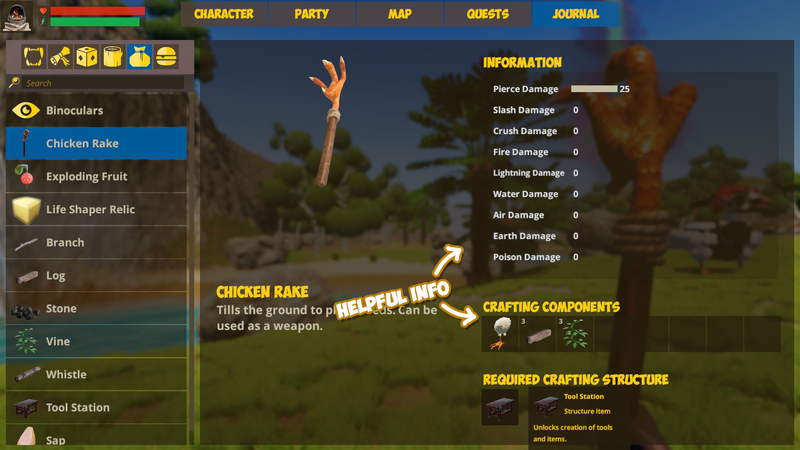 Items you craft or find are also logged. Updated Journal entries provide more in-depth information on everything you’ve logged. View Life Block stats and abilities, an item’s crafting components and station requirements, what kind of resources objects drop, etc. The creature category now hints at creatures you have yet to discover. Explore the world to find them all! Get all the info you need on a creature you’ve found in the world, or check out any other item you’ve discovered using the categories on the left. Adventure Mode has new gameplay updates for a more fun and rewarding survival experience. Creature parts have more uses in crafting. Will you add a scavenged chicken leg to your creature, or turn that leg into a Chicken Rake? YOU MUST CHOOSE! Abilities are now “looted” when you defeat a creature with that ability for the first time. Defeat wild creatures to learn their secrets! Raw meats can now drop when a creature is defeated. Mmmm, meat. The Lifeshaper is now an item in your inventory. You can cast it to build or edit a creature if you don’t have a Life Block handy. The UI has been updated in several places to be easier to use and read, and to provide you more info about the world. Creepy blank eyes in the Arena crowd now have pupils. Bye, zombie crowd. Occasionally the game will get stuck on syncing creatures during start up. Removing player profiles should unblock this. We’re working on a fix! Textures may be blurry due to new texture streaming tech implementation in progress. Thanks a bunch for helping us test! We hope you like the Journal and Adventure changes. We’ll have another Pre-Release update for you next week.